Fully stocked range of pet care products with the lowest prices. Express shipping to your door with a prescription from your veterinarian. Premium pet food brands with reward points earned on every dollar spent. All orders over $150 and less than 500g receive free express post shipping. Petceutics, a pharmaceutical e-business was established in 2012 with the vision to provide pet owners with the most affordable option when it comes to purchasing medication for their animals. Petceutics operates from a registered NSW pharmacy called "The Animal Pharmacy". We cater to various animals such as dogs, cats, birds, exotics, farm animals and horses. Our non-prescription products includes pet care products like apparel & accessories, dental health, fleas & ticks, vitamins & minerals, premium pet food and much more. Prescription products for antibiotics, vaccines, respiratory medicines, auditory medicines, cardiovascular medicines range across brands like Apoquel, Vetmedin, Previcox, Cardisure and many more. With a veterinarian’s prescription, we can dispense the products to your door step with free express shipping on orders over $150 and under 500 grams. 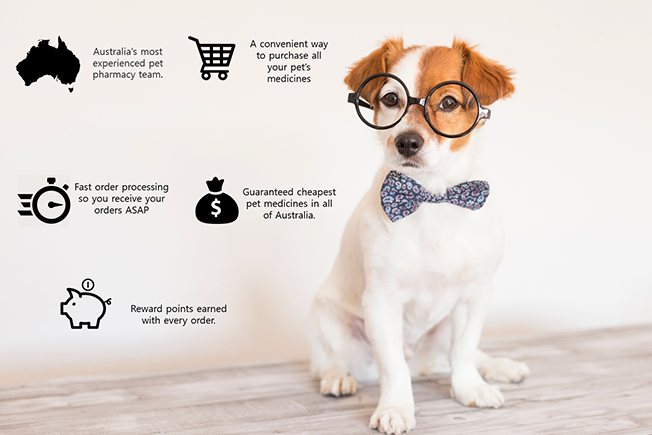 We pride ourselves on the guarantee of the cheapest prices for pet medicines in Australia, fast order processing and excellent customer service. We operate from a fully licensed pharmacy, and can supply pet medicines to all States and Territories of Australia. Thank you for visiting the Petceutics website. We look forward to serving you and your pets in the future. Hassle free ordering of medication for my dog, made easy with telephone communication about requirements for sending physical script as well as great email communication about when the item was shipped and tracking information. Very fast delivery also. I like the fast service and the prices of pet medication. Most vets try and make a big profit on these medications especially repeats ones. This is better for us and better for our pet that needs this medication. Everything about your Company is very professional. Ordering is easy and the communication is always simple and fast. You have made my beautiful boy's life easier with the medication I receive for him and my life a little less stressful due to the cheaper prices!